The Bishop is likened to a laser… it slices across the board cutting through everything in it's path. 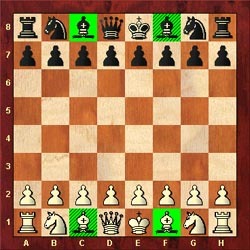 Each Bishop stays on the diagonal color of its origin and combined can control every square on the board. As you develop more knowledge of the game, you become more familiar with the power of two coordinated Bishops. 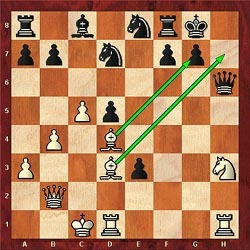 The Bishop on the d5 square reaches all sides of the board along the h1-a8 and a2-g8 diagonal. In Diagram #2 the Bishop can move as far as there is nothing in it's path. If there is an enemy piece in the Bishop's path, then it has the option of capturing it. 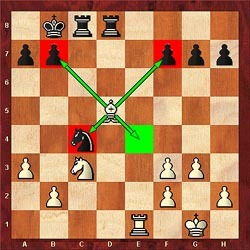 Those black pieces marked in red can be captured by removing the selected black piece and replacing it with the white Bishop. Bishops are often used as weapons for attacks on the King because of their long range power and the ease at which they are able to free themselves. 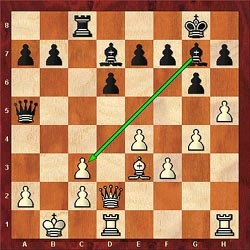 In Diagram #3, the Bishop on g7 has been placed on one of the longest diagonals and cuts the board like a laser beam. This is called the "fianchettoed" Bishop and is demonstrated in Diagram #3. Perhaps the "dream position" for Bishops is when they are on adjacent diagonals exerting tremendous power on enemy positions. 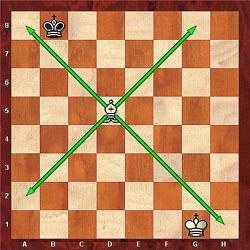 The white Bishops in Diagram #4 are said to be "raking" the board.